I have always been fascinated by hidden storage options and dreaming of having something like that – whether it is a door under the staircase that opens to a craft or book wonderland, the stairs themselves that are treasure chests at the same time, or a secret pantry behind what looks like a usual kitchen cabinet. Awesome as they are, most of these ideas are custom-designed, being anything but easy or inexpensive, and totally not suitable for people living in the tiny apartments. However, I have eventually found something that works for me and could work for anyone in any small spaces. 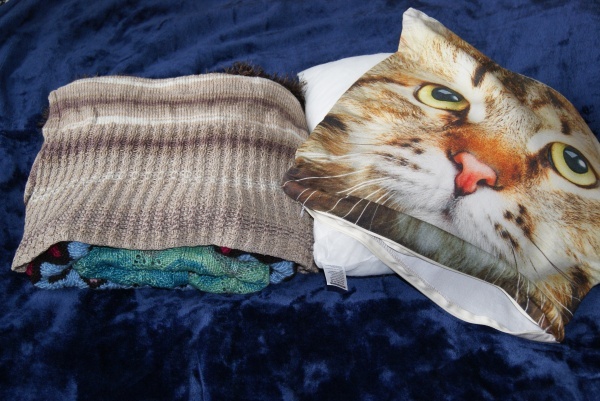 Here are four creative ways to use your decorative pillows to store your stuff. Decorative throw pillows can add lovely accents and stylish details to a room, but otherwise than that, they are useless, right? They probably have been – until zippers and Velcro closures were added, making whatever’s inside easily accessible and removable. Now, what’s inside – some stuffing? What a waste of space! How about swapping it for stuff that you don’t know where to stuff or where to store for finding it quickly when needed? A removable decorative pillow cover is that perfect place for items you can’t put away, like, too far or too high away on the shelves – but still, you do not want them scattered around or taking precious center stage space in your closets or drawers. Everyone has their own list of such items – extra towels or bed linens, a fleece blanket, a pair of sweatpants, you name it. For me, this used to be an equation with too many variables before I turned to decorative pillows – an especially great hack when that closet space is scarce or you have no closet at all. Let me give you a specific example – plastic bags in the kitchen. These usually were either overflowing from a basket and flooding my floor or cluttering drawers and littering shelves. Words can’t describe how messy this was. 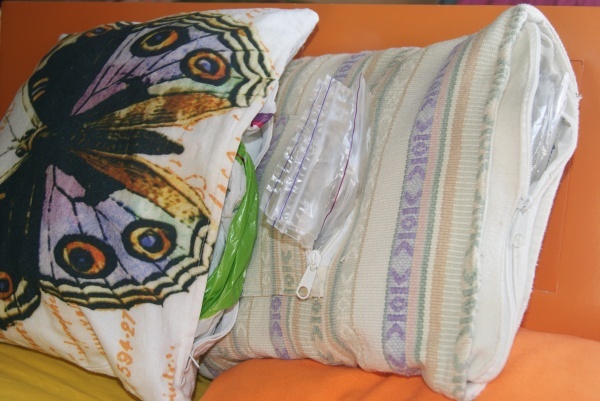 Now I just have a few lovely ‘decorative pillows’ in the kitchen hiding plastic bags of different kinds and sizes. To find a small one or a large one, I don’t have to dig through a big pile anymore – I just know which pillow cover to unzip to take it out. What’s even better – though I’m personally still trying to neatly fold plastic bags when someone pulls out a whole bunch and just stuffs it back in, the ‘pillow’ still looks like a pillow, not like a real mess. In rentals and small places, storing off-season items is often a problem that keeps people living out of boxes for years. So if your warm blanket is destined for a summer vacation in a box, or takes up a big part of your closet space which could be used for clothes instead, you might as well make a long cylindrical pillow out of it. Roll it up snugly and secure in shape by wrapping an elastic band around it. You can use strips of fabric instead of the elastic band, or even things like old tights and scarves. A special cover can be purchased to complete this kind of long bolster pillow, or it is also easy to sew from one long rectangle folded lengthwise. But you can skip investing additional time or money into this. Just use any fabric or a bed sheet of the color you like to wrap your blanket roll in it and tie the ends with ribbon, decorative cord, lace or anything you consider matching. 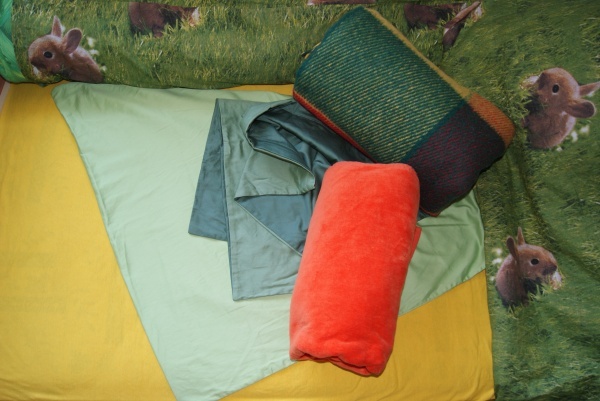 Besides looking nice and saving your closet space, these ‘blanket’ pillows can be handy if your bed is near a wall. Placed next to the wall, they prevent books, toys, and phones from falling through the gap between your bed and the wall. 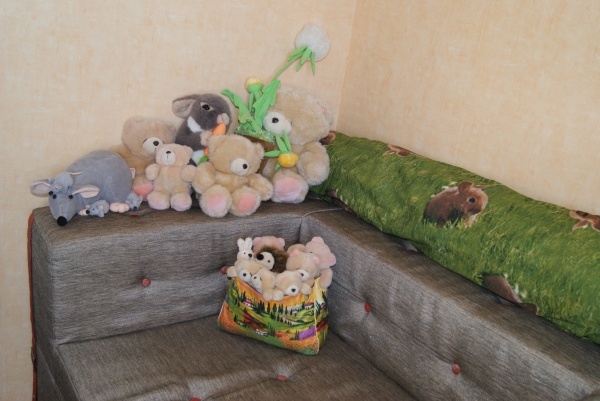 They can also be used as a kind of positioning pillows (body pillows) for people who love to hug these while they sleep. Whether you are trying to decorate your first rented apartment or to give a new look to the house you have been living in for years, adding or changing some throw pillows and wall art is the easiest known way to do it. However, this may not be budget-friendly. If you need a room makeover on a minimal budget, consider just getting decorative pillow covers that are way cheaper. 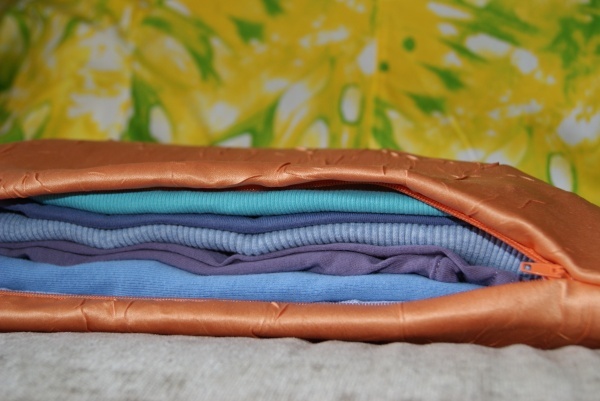 These can be simply filled with items like sweaters, knitted scarves, fleece throws, towels, pajamas – folded or rolled up, depending on the shape you need as a result. 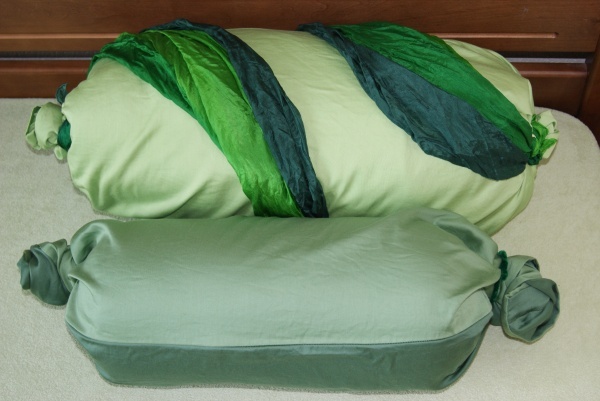 This is also a good idea for putting standard pillowcases to good use if they come with a bed set you like but are too big for your pillows (I know I’m not the only person who finds cute ones on sale, but they come with huge pillowcases). Just place something that’s rolled up inside, then roll up the pillowcase over that, and tie the ends. Cylindrical pillows are super easy and fun to make on your own because it can be a no-sew project that requires no special supplies or skills, and it’s great for repurposing clothes that are seldom worn or can’t be worn anymore. The covers for such decorative cylindrical pillows can be made from your favorite old T-shirts with fun prints, jeans or trouser legs, sleeves of jackets and knitwear. Just roll up some fabric or towels according to the size of your DIY cover, put it inside, twist the ends and tie them. If you don’t feel like parting with your clothes for sentimental or other reasons, give them a new life of usefulness and make room in your closet for things suitable to wear more often. Whether you are a fan of decorative pillows or not, you may start respecting these more, viewing them as useful and functional items. If you have always thought that owning extra pillows only adds to the clutter, it is time to discover they can actually swallow up some of your clutter and give it a home. Isn’t it great that such decorative things can also be used as storage?